Beyond the standard grilling, each region of Greece also has its own customs and traditions which are celebrated on this day every year. Athens – In the area of Plaka (downtown Athens) carnival capers make their way around the region’s central squares and in the evening a parade is held -which begins at the Acropolis metro and heads through to Monastiraki area with music and dance-. Corfu – On the island of Corfu the “Corfiatika Petegoletsia” are held. The word Petegoletsia means gossip and this is one day of the year where you are obligated to yap, yap away! After consuming their meaty meals locals apparently gather at the Piazza near “Koukounara” to “socially criticize” one another. Patras – In Patras, the custom of “Yiannoula tis Koulouras” is celebrated. According to tradition, Yiannoula (Johanne in English) still believes that Admiral Wilson will come back to her city so he can sweep her off her feet and marry her. As such, she patiently (and frantically) awaits for him at the city’s main port. In respect to the tradition, Patras citizens choose a young girl from the area every year, dress her up as a bride and once she begins acting out the role of Yiannoula they celebrate by singing and dancing around her. Serres – In the northern city of Serres locals set grand fires ablaze. After roasting their meat, and guzzling up some Tsipouro they then leap over the flames. Komotini – In the city of Komotini, housewives purposely burn a chicken so that they can serve it to their families on the last Sunday of Carnival. Tradition also says that on Tsiknopepmti engaged couples exchange edible gifts. For instance: the groom sends a “kourko” or poultry to the bride, and she returns the favor by sending him a baklava and a stuffed chicken. Thebes – In Thebes, a “Vlach wedding” is held. At first the matchmaking begins, and then an actual traditional “Vlach wedding” is held. The dancing and the singing continues for days and ends on Lent Monday when the bride’s dowry is paraded across town and another feast is held. Ios – On the island of Ios, masked men, wearing cow bells (or sheep bells) around their waists trek all over the island and spontaneously visit homes and shops. Poros – On the island of Poros, the youth is encouraged to steal pasta! (Or at least one macaroni). They then place the macaroni under their pillows at night to see who they will marry. 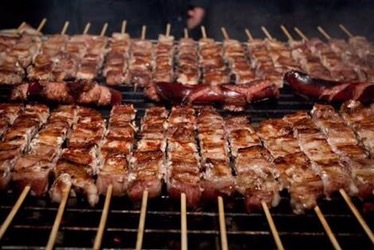 Peloponnese – Throughout the Peloponnese locals slaughter pigs and then make numerous traditional meat dishes including picthi (which is cured pork in fat), tsigarides, sausages, gournaloifi and salted pork (otherwise known as ‘pasto’). Skopelo – On the island of Skopelos, residents meet in the area of Pefko and celebrate and feast together. On this day, similar events are also celebrated in other areas of the world where carnival is celebrated as well. For instance in Italy, Giovedì Grasso (Fat Thursday) is also celebrated, but it is not very different from Martedì Grasso (Shrove Tuesday). It is more similar to Tsiknopempti and involves the massive consumption of charred meat. In Spain this celebration is called jueves lardero, and in Catalan-speaking areas, dijous gras. In Albacete, central Spain, Jueves Lardero is celebrated with a square pastry called a bizcocho and a round pastry called a mona. Whereas in Aragon a meal is prepared with a special sausage from Graus while in Catalonia the tradition is to eat sweet Bunyols. In Germany, Weiberfastnacht is an unofficial holiday. At the majority of workplaces, work ends before noon and celebrations start at 11:11 am. In comparison with Rosenmontag, there are hardly any parades, but people wear costumes and celebrate in pubs and in the streets. Beueler Weiberfastnacht (“washerwomen’s carnival”) is traditionally celebrated In the Bonn district of Beuel. The tradition dates back to 1824, when local women first formed their own “carnival committee”. The symbolic storming of the Beuel town hall is broadcast live on TV. In many towns across the state of North Rhine Westphalia, a ritual “takeover” of the town halls by local women has become tradition. Among other established customs, on that day women cut off the ties of men, which are seen as a symbol of men’s status. The men wear the stumps of their ties and get a Butzchen (little kiss) as compensation.